Auto-R products are directly imported by Showoff Imports. We stock over 400 bodyparts from AutoR. Non-stock items will be specially imported for you and can be here in a couple of weeks. The AutoR products may be known by some 'oldschool tuners' under the name of Aerotrenz, which are the same perfect fitting products from the same factory. All Auto-R items are made of FRP, Fiber reinforced plastic. This is one of the best fiberglass qualities in the tuning industry. Of all available bodykit brands, Auto-R is one of the best products money can buy. We guarantee a perfect (OEM) fitment on all products. Not made in china, but over 5 layers of handlaid fiberglass. You can mix any front bumper, rear bumper, and skirts to select the bodykit you want. If you order a full kit you even get a 5% discount as online customer. To get your discount, please use Coupon Code ‘AUTOR’ during checkout/finishing your online order. This way your discount will be automatically taken of your invoice/total. 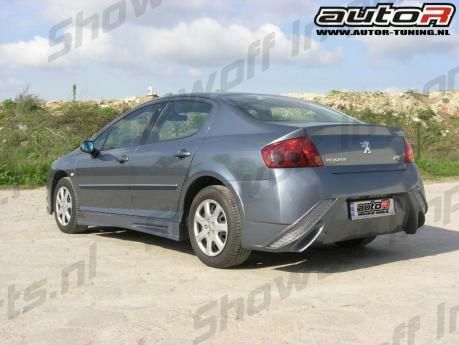 I found the Peugeot 407 04+ 4D Rearbumper Champion [AUTOR] on ShowoffImports.nl and thought you might like it.